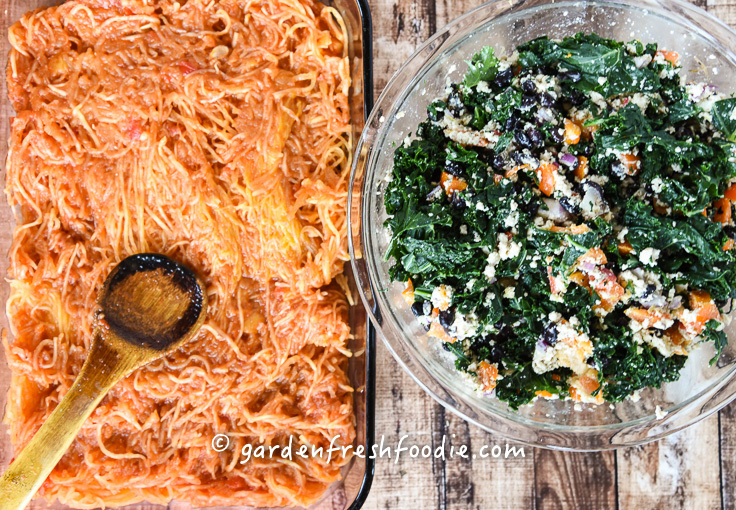 Love pasta but want to replace it with something less processed or create a gluten free meal? 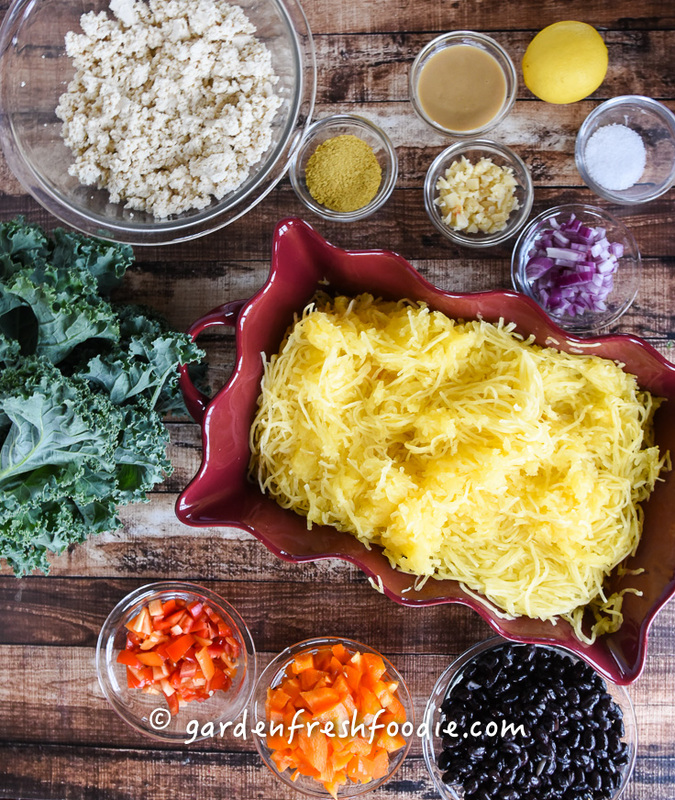 Try spaghetti squash! 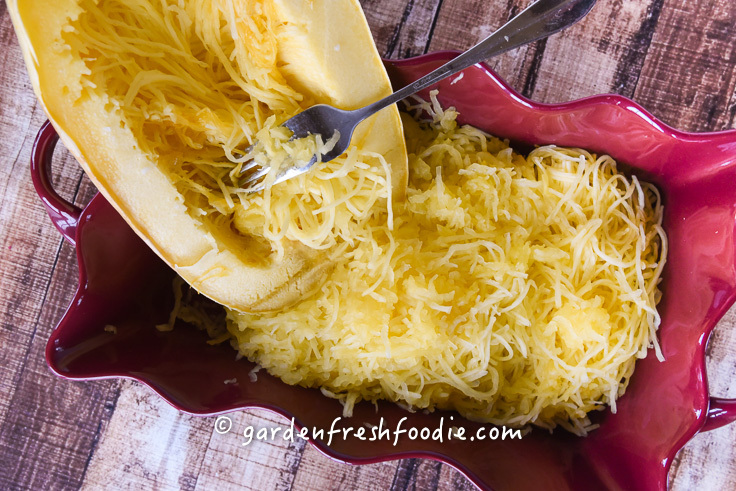 Spaghetti squash is a winter squash, meaning it stores well, and is in-season during the fall and winter. Like all squash, it has a great supply of micronutrients. It’s stringy texture lends itself to being cooked and eaten like a pasta. Top it with your favorite red sauce of pesto! 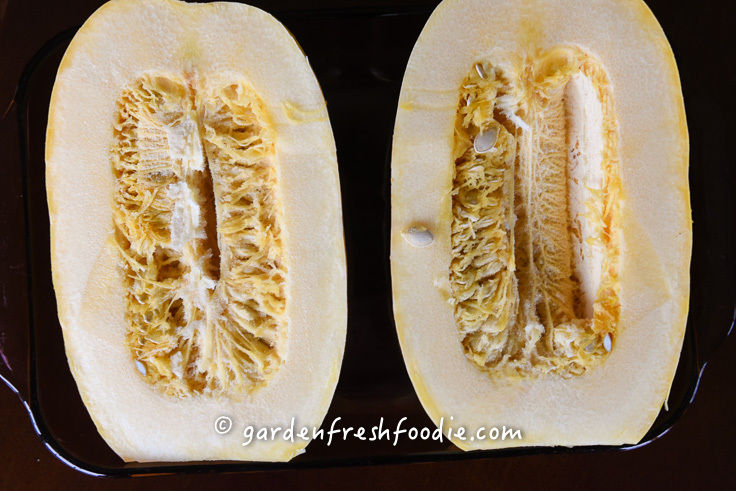 This squash can be cooked quickly in a microwave and is a great swap for pasta. Remove from microwave (be careful jot to get burned by steam) and use a fork to scrape out flesh. It’ll come out in strands. Cashew Cheese *omit if desired, to make, see here. *Note if making full recipe of this, you will only need half and the other half can be frozen for a later time. In a separate bowl, mix tofu ricotta filling. Place half of spaghetti squash in a 9×13 pan, top with ricotta filling, and then remaining squash mixture. *Alternatively, you can place half of the tofu ricotta filling in the middle and the other half on top to omit the cashew cheese. Add about a 1/2 cup of cashew cream on top of squash. If not desired, omit this (can use another non-dairy cheese if desired). 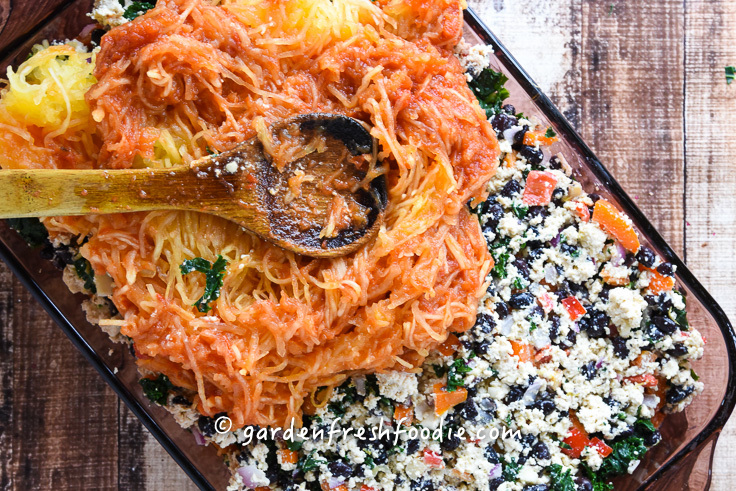 Anti-oxidants: While not as nutrient dense as other squash, spaghetti squash provides 5% of the DV for Vitamin A, 10% percent of the DV for Vitamin C and 8 % of the DV for dietary fiber. 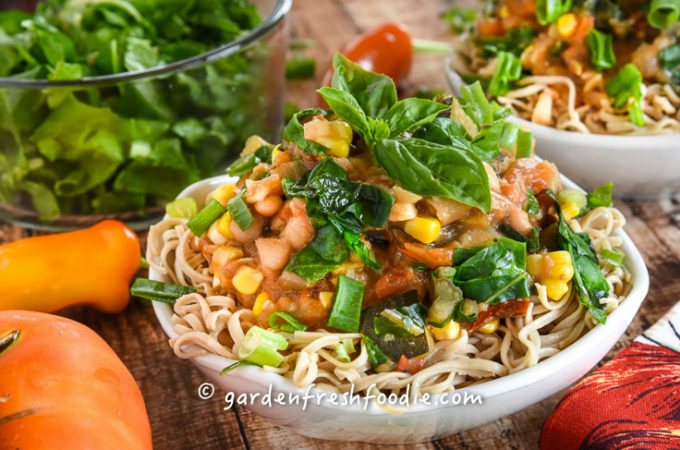 Topped with tomato sauce you will gain the added benefits of tomatoes, a nutrient-packed food with many cancer fighting properties. One cup of cooked enriched spaghetti yields 221 calories, 1.3 g of fat, 43 g of carbohydrate and 2.5 g of fiber. Pasta does provide more B vitamins. If you have diabetes or are watching your weight and carbohydrates, you can save 179 calories and 33 g of carbohydrate by eating a cup of spaghetti squash instead of a cup of pasta. *If prepared as above, you will increase your protein amounts, increase fiber, and added calcium from tofu and greens. Your fat content will increase as well, however it will remain free of cholesterol and saturated fat. 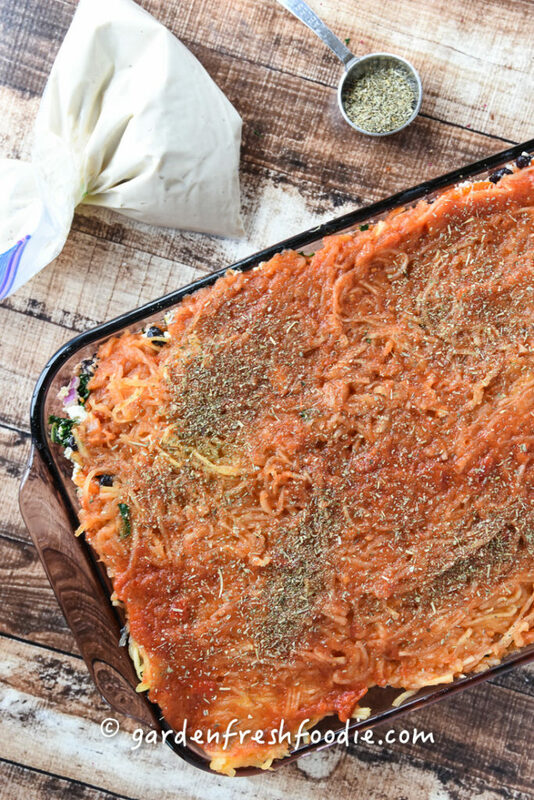 Vegan Baked Spaghetti Squash, swapping out spaghetti squash for noodles, this nutrient packed dish is great for a crowd! *Note if making full recipe of this, you will only need half and the other half can be frozen for a later time. Add about a ½ cup of cashew cream on top of squash. If not desired, omit this (can use another non-dairy cheese if desired). 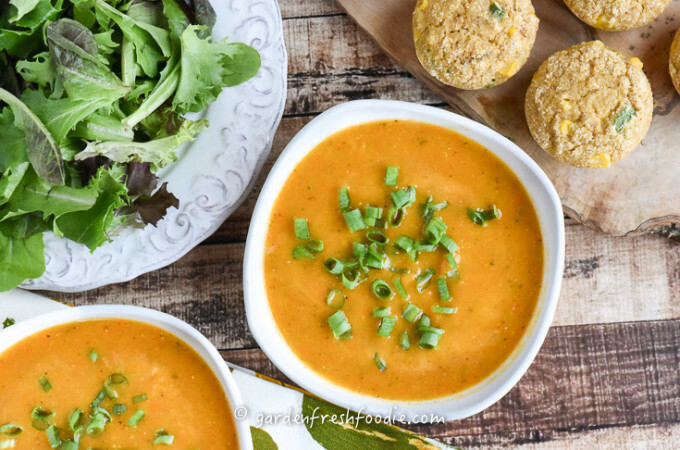 We tried this recipie tonight – it was easy to make and soo hearty on a cold winters night. 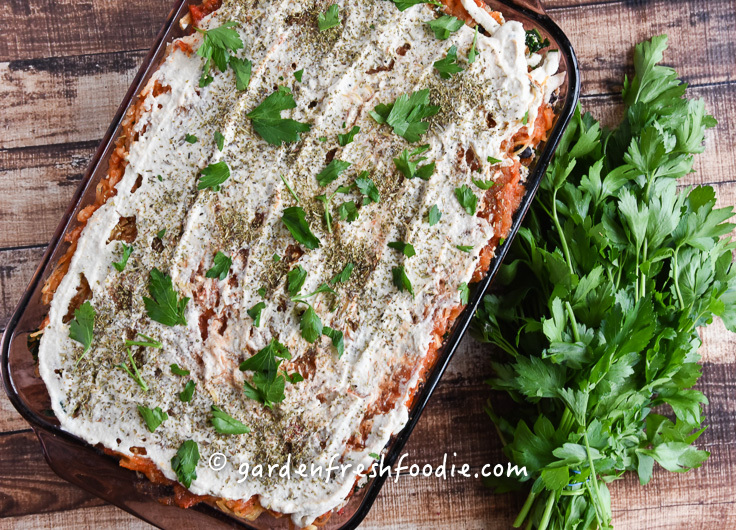 We baked some eggplant and put that in as well – delicious! Great call with the added eggplant! Yum! So glad you enjoyed!! 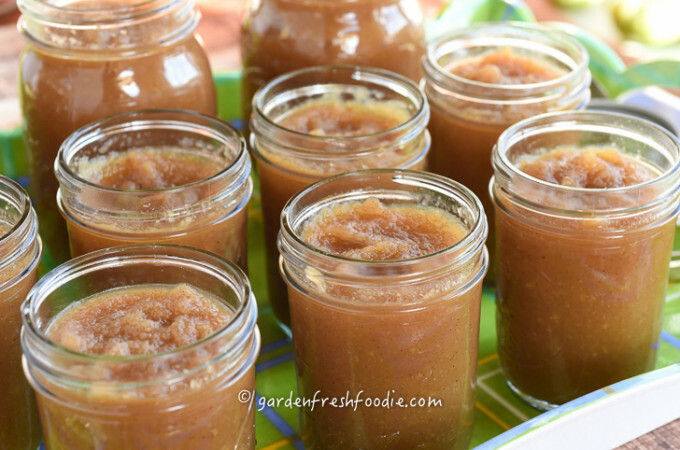 I just finished making and eating this recipe! It was super easy apart from cutting the actual squash, that gave me a bit of trouble. Thanks for the recipe! One year later and this is still my favorite dish!